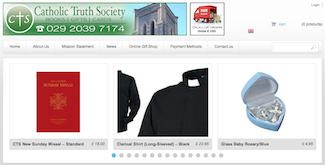 It has recently been announced that the Catholic Truth Society (Wales) Bookshop currently situated next to St. David’s Cathedral, Cardiff is to close this coming Saturday (15th August 2015) indefinitely whilst the organisation undergoes a restructure. Exact details as to when the society will resume operations are unknown. The online store has already ceased trading. As more information becomes available we will endeavour to keep you posted.